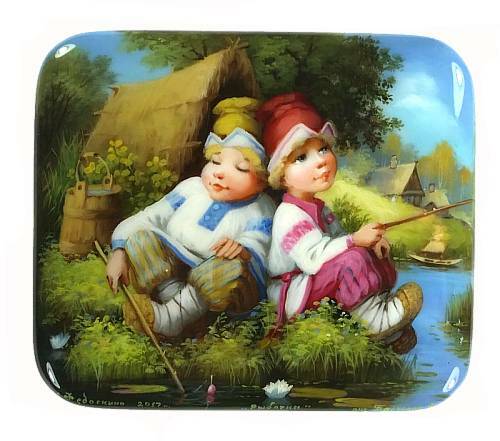 In this rectangular box, Fedoskino artist A. Pyastalov paints a dreamy summer day where two children spend their time fishing at the side of the lake. A much older fisherman on the back side of the box fishes quietly from a canoe. Leaves from a tree extend from the young lads to the old fisherman and seamlessly connect the two in space and time. 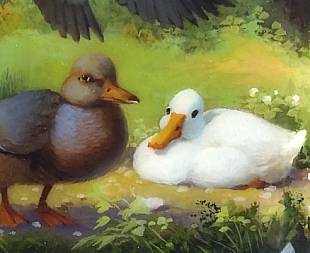 On three sides of the box are some beautifully detailed ducks, some in the water, some on the land, and one in flight. Even cuter are the four little ducklings swimming beside their mother on one of the sides. The artist also drew an image on the bottom of the box, too -- a lovely white water lily. 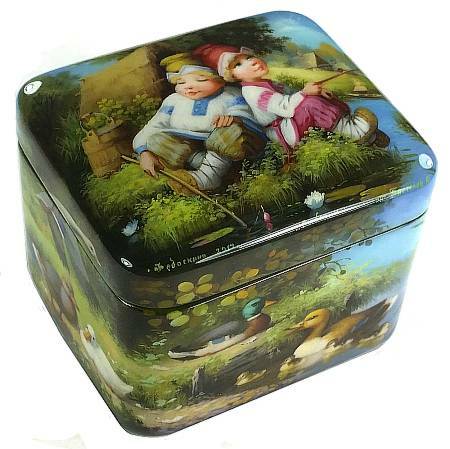 The box is masterly painted in Pyastolov's charming and unmistakable style. Very easy to fall in love with his boxes, and this is one of his better ones. The box has a hinge at the top and sits flat on the surface of a table. The interior is red. The name of the artist, the village, the year, and the title of the box are written below the two children.